|} Chiang Kai-shek was a Chinese nationalist politician and military leader who was President of the Republic of China, born in Xikou on October 31, 1887. His father was a merchant who died when Chiang was eight years old. Chiang became an officer in the army of the Manchu empire, but supported the Chinese Xinhai Revolution of 1911 that converted China into a republic. He led the Republic of China from 1930 to 1949 on mainland China until he was overthrown by Mao Zedong in the Chinese Civil War. He fled to Taiwan where he ruled from 1950 until his death in 1975, although his government was still officially called the Republic of China. After his father died, Chiang joined the army. At first, he went to Baoding in northern China to study military science. Later, he went to Japan to learn more about the military. On October 10, 1911, Chiang Kai-Shek came back to China. In 1918, he joined the Nationalist Party of Sun Yat-sen. Sun Yat-sen helped Jiang Kai-Shek make a military academic school called Huangpu Military School. In 1926 and 1927 he led the Northern Expedition to conquer local warlords and unify China. After Sun Yat-sen died, he pushed out the Communists in 1927. In 1928, he made a new government in Nanjing, and became head of the state. He focused on fighting the Communists and the Empire of Japan. 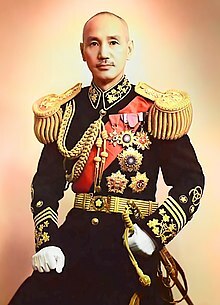 ↑ "Chiang Kai-shek - Facts & Summary - HISTORY.com". HISTORY.com. Retrieved 2017-05-17. ↑ "Chiang Kai-shek | Chinese statesman". Encyclopædia Britannica. Retrieved 2017-05-19. ↑ "Chiang Kai-shek - Facts & Summary - HISTORY.com". HISTORY.com. Retrieved 2017-05-22. ↑ "Chiang Kai-shek | Chinese statesman". Encyclopædia Britannica. Retrieved 2017-05-30. This page was last changed on 23 April 2019, at 20:25.